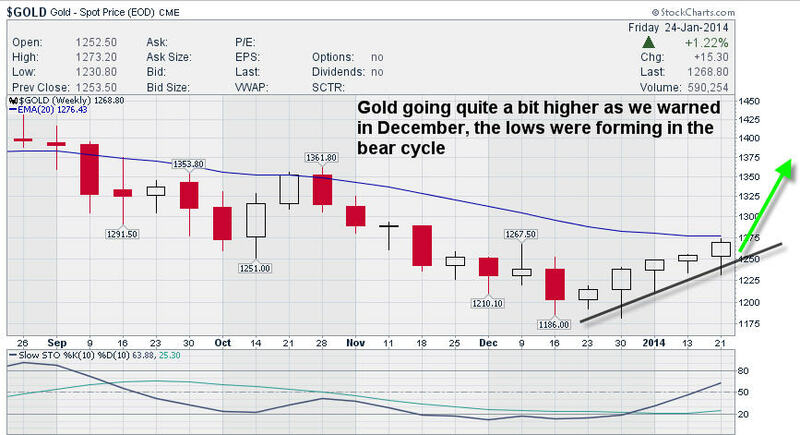 Stock Investors News » Gold and Silver Ready To Rumble Higher? Browse:Home Trading Strategies Gold and Silver Ready To Rumble Higher? see bottoming 5th wave patterns combining with public sentiment, bullish percent indexes, and 5 year lows in Gold stocks. This is how bottom in Bear cycles form and you are witnessing the makings of a huge bottom between now and early February 2014 if we are right. Since that article a few of our favorite stocks rallied 40-50% in just 3 weeks or so from the December timeframe of our article. A recent pullback is pretty normal as we set up for Gold to take out the 1271 spot pricing area and run to the mid 1300’s over the next several weeks. By that time, you will be kicking yourself for not being long either the metals themselves or the higher beta stock plays. our subscribers that are already doing very well. What will trigger this next rally up is sentiment shifts to favor Gold and Silver over currency alternatives. The precious metals move on sentiment, much more so than interest rates or GDP reports or anything else in our opinion. Sentiment remains neutral to bearish as evidenced by the larger brokerage houses running around in January telling everyone to sell Gold, so we see that as a buy signal on top of our other indicators.